Huddle Up judges, and here’s our Game Plan! Welcome to your May issue for all your judge news! We Aim High to bring you all the content you may have missed, as well as a Thrilling Encore! Check out the Battlebond 2HG release notes in Policy, and head to the bottom for a Sweet surprise! Don’t forget to find out who our Exemplar Vanguard is, and take a look at the Wave 12 token image! Some tweaks were made to how notifications work on JudgeApps and how the Grand Prix forums are structured. Dan Collins published a forum post and a blog post were you can read more about these changes! Have you ever wondered how the Exemplar Program selects its Token- for the Vanguard judge? You can read about the full process here as well as why Tomasz Ludkiewicz was selected to be the Vanguard for Wave 13! Are you attending a conference in the near future and do you want to know what are you getting in those sweet packs of foils? Wait no more! You can find here which cards are in those conference support packs. 256: Exemplar Wave 12 Features (Part 1)! 258: Exemplar Wave 12 Features (Part 2)! A big welcome to the following judges who worked their first GP in 2018! An article was written on the assessment of gender bias in the pathways to Level 3 certification. Read on what they found, and how it may affect the program or yourself if you want to pursue Level 3. Wave 13 has announced its Vanguard! Tomasz Ludkiewicz, who you can read about in Judge of the Week, will be featured on the next judge token! Wave 12 tokens! Check out the image of the new token for wave 12 exemplar nominations. You can expect yours this wave! Questions asked in the Month of May and an [O]fficial answer, just for you! 1. AP casts Doomsday, and during the resolution he chooses three cards from their library, and two cards from their Graveyard. Does NAP get to know the identity of any of the cards chosen? If so, is AP responsible for communicating that information, or does NAP have to figure it out? 2. AP controls a Tarmogoyf and NAP flashes in a Merfolk Trickster. Will Tarmogoyf die? A: Tarmogoyf will be a 0/1 and survive! Normally, Tarmogoyf’s CDA overrides its printed power and toughness. However, if Merfolk Trickster has removed that ability, we are left to determine Tarmogoyf’s power and toughness the same way we determine those values for any other creature: by looking at what’s printed in its power/toughness box. For Tarmogoyf, what’s printed there is “* / 1+*”. Since * does not have a numerical value, we use 0 instead, just as we do for any other number that can’t be determined. Therefore, Tarmogoyf’s power and toughness is “0 / 1+0”, also known as 0/1. 3. AP controls a Metallic Mimic, that named Snake as it entered, and casts Winding Constrictor. With how many counters will this Snake enters the battlefield? A: “The ability of a Winding Constrictor entering the battlefield in this situation will not apply to the Constrictor itself, and therefore Winding Constrictor should only receive one counter. 614.12 is explicitly defining the set of replacement effects that modify how a permanent enters the battlefield, and it does so by listing two basic classes of such replacements: replacements from that permanent that affect only that permanent, and replacements from sources other than that permanent. 4. A player controls Multani, Yavimaya’s Avatar on the battlefield. Can this player activate Multani’s ability? A: The answer to this question is covered by rule 112.6k: “an ability whose cost or effect specifies that it moves the object it’s on out of a particular zone functions only in that zone, unless that ability’s trigger condition, or a previous part of that ability’s cost or effect, specifies that the object is put into that zone. The same is true if the effect of that ability creates a delayed triggered ability whose effect moves the object out of a particular zone. So, a player can only activate Multani’s ability whenever she’s on that player’s graveyard. Investigations in What’s Up, Docs? For this month we would like to share with you an interesting article on how to detect, identify and prevent lying. A must-read for all aspiring investigators! The two latest scenarios in the Knowledge Pool are Team Bonding Exercise and All Aboard! Make sure that you check out the Dominaria New Set Digest outlining rules, policy and lots of other changes to go with it. If you are trying to keep up with everything, the article has everything you’ll need all in one place. Find out which Judge Conferences, Grand Prix and SCG Opens have available worldwide staffing positions! You still have some time to apply for GP Detroit, GP Hong Kong, GP Stockholm, SCG Open Philadelphia and SCG Open Indianapolis! Public Projects such as GP Travelguides and Random Situation Generator are looking for awesome judges who can help! If you wish to get more out of your Judging experience and give back to the community, sign up for something that interests you! 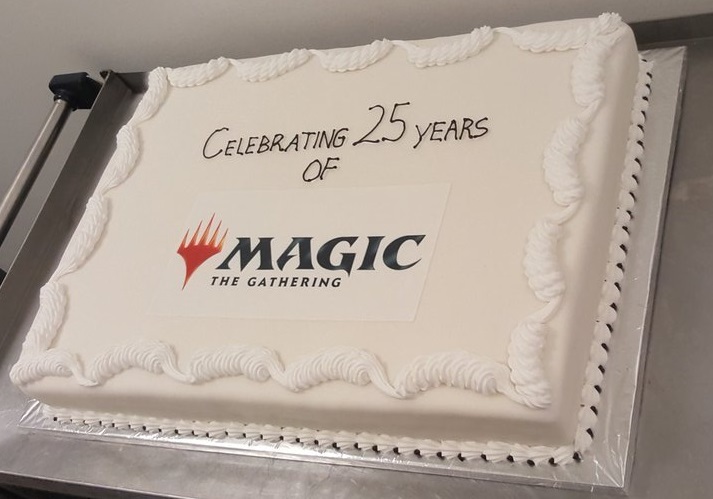 Check out the cake from GP Birmingham! That’s really sweet!